Ziemlich beliebig und austauschbar. Nicht wirklich schlecht, doch von Taylor Swift die für mich bisher schlechteste Single.<br><br>Die Album-Version (ohne Kendrick Lamar) hätte von mir knappe vier Sterne bekommen, für die Single reicht es bei mir zu drei Sternen. Hmm. I don't mind this.<br><br>I think the music video and Kendrick Lamar's involvement help this a lot for me, as Swift by herself would just annoy me.<br><br>So, it looks like we'll have a Taylor Swift hit that I don't dislike. Or perhaps (even though unlikely) even like in the future :-X<br><br>Let's see if radio play helps or hurts this. 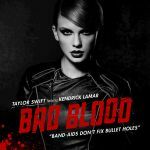 Because every pop song needs a rap.<br><br>But yeah, it doesn't really fit (and Kendrick wanking over the chorus doesn't help either) and this clearly only exists because Taylor is savvy enough to know that while Bad Blood was considered by many fans to be the weakest song on the album, they'd still feel compelled to buy (on re-reading I do have to add in "or listen to" here; #joysof2015) an even worse remix, and bang, massive hit! Or perhaps she personally loves Bad Blood and upset at the criticism she decided to add in an out of place rap or two and give a worse performance herself to make people appreciate the original more. That's how it worked for me. I don't like this but it'll fit perfectly amongst the 2015 ARIA #1's so far if it gets there. Es gibt zwei Dinge, die der menschliche Verstand niemals begreifen wird: Den Sinn des Lebens und den Erfolg von Taylor Swift.<br><br>Ihre bislang schlechteste Single. Steht in Amerika freilich schon wieder auf der 1. Taylor you are amazing  This is by far your best song ever, and I hope it manages another week at number 1. Kendrick Lamar is one of my fav rappers, too, so making a collab with him was awesome. 100/100 no errors in this song- I wanna just get my act together, and find a chick I can duet-cover this song with.<br>This is seriously the kind of song I'd cover. 4 stars might be a bit generous but I do find this song alright and I do like the Kendrick feature.<br><br>I do wish she would sing about something other than break ups so for that reason I wont give it more points.